Microsoft recently regularly releasing updates build to Windows 10 operating system from 10149, 10162, 10166 which bring improvement, new features, and bug fixes. And now, Microsoft has rolled out final build – Windows 10 Build 10240 to Windows Insider members for both Fast and Slow ring. Windows 10 Build 10240 is the final build to test the Windows 10 update and also believed as the RTM (Release to Manufacturing) version which was sent to PC OEM manufacturers to load on the Windows 10 PCs and tablet devices. 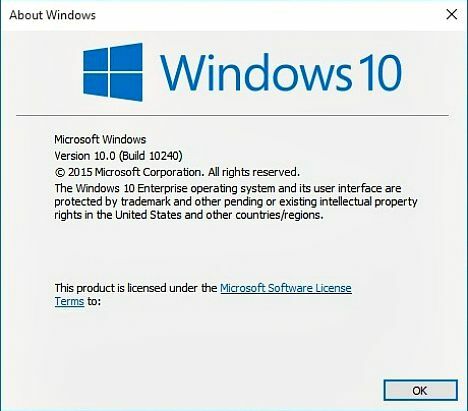 Build 10240 will not available in ISO files until July 29th as the company wants all testers to upgrade through its Windows Update mechanism to make final tweaks and changes. However, Microsoft will rapidly release Windows updates or upgrades include extension support for the Microsoft Edge browser and app updates in the Store over next 2 weeks for device running Windows 10. Meaning that, Windows 10 users will continue receive Windows update once upgrade to Windows 10 Build 10240. 112% faster than Chrome on WebKit Sunspider. 37% faster than Chrome on Apple JetStream. 11% faster than Chrome on Google Octane. If you’re already a Windows Insider members then just simply check through Windows Update to receive the latest Build 10240, or go to Start > Settings > Update & Security > Windows Update > Check for updates. Note: In order to receive the build, you need to be logged in with your Microsoft Account.